Vertebrate Hair Cells provides a current overview of the mechanosensory receptor cells of the vertebrate inner ear. 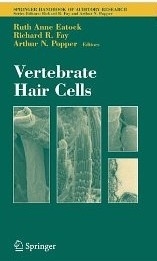 Each chapter is written by experimentalists active in exploring a particular set of questions in an aspect of hair cell function, including development, transduction, and synaptic transmission. Experimental approaches described include molecular, genetic, ultrastructural, biophysical and computational. Thus, each chapter covers not just what we know, but how we have learned it and the implications for future work. The experimental focus differentiates this book from general textbooks and targets an advanced audience, from senior undergraduates through to scientists in the field of hair cell research.